It has been over two weeks since my last post. Dog gone it, I was finally on a consistent schedule and then was completely blind sided! However painful, sometimes these detours are necessary. "Consider it pure joy, my brothers, whenever you face trials of many kinds" James 1:2. Not because it is enjoyable or easy, but because of the person you will become for having gone through it. I am in a better place today than I was a few weeks ago. It is amazing the amount of emotions that our hearts and minds can accommodate! One thing is for certain, I love my life and I trust my God! There is a common theme that has been present over these past several weeks... GOD IS WORKING. Even when I don't see it in my time. Even when I don't "feel" like he is. 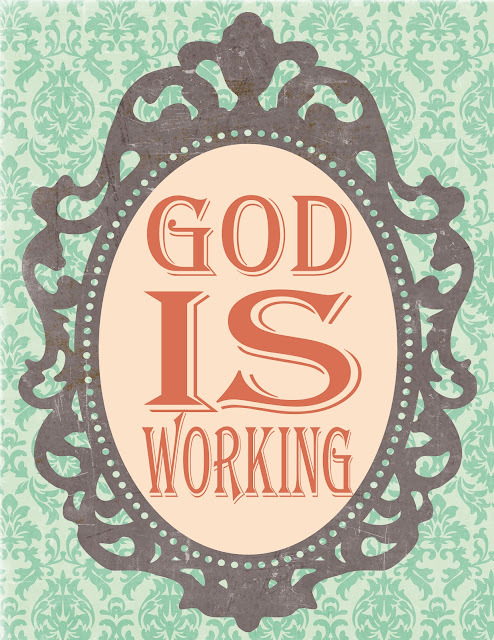 Even when the world views a situation as hopeless, GOD IS WORKING. I didn't have a lot to say today, but some times less is more. I know there is someone that needed to be reminded of this today! You are so loved and so amazing and there is no one quite like you. Give yourself some grace because you get up each morning with breath in your body and recognize that today is a brand new day!